Ulster director of rugby Les Kiss says they will "stick by" Marcell Coetzee after the South Africa flanker was ruled out for nine months following a further knee operation. 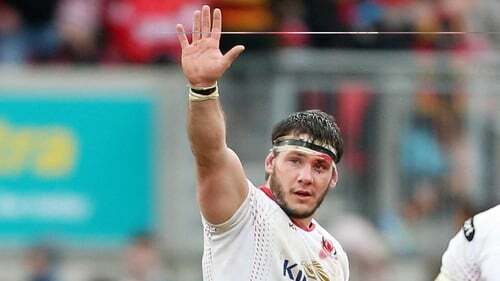 The 26-year-old forward returned to his homeland for treatment on a ligament problem which has restricted his appearances for Ulster to just five games - with just one outing this season - since joining the Irish province in 2016. Ulster announced earlier on Friday that Coetzee had this week undergone what has been described as "revision surgery" on his left knee and that this has a recovery period of nine months. That means Coetzee, whose contract runs until the 2018-19 season, is not likely to return to Ulster until next summer's pre-season. Speaking after Ulster's 19-9 European Champions Cup win over Wasps on Friday night, Kiss scotched any notion that the injury-ravaged Coetzee would be cut loose. He said: "We'll stick by him, he's here and he has a contract with us." Ulster had been trailing 9-3 early in the second half against Wasps but in the 54th minute Charles Piutau created Jacob Stockdale's fifth try in five games. Two minutes later Piutau and Stockdale combined again before Stuart McCloskey barged over, and Christian Lealiifano closed it out with two late penalties. "We were our own worst enemies up to half-time," Kiss added. "We just had to protect the ball a bit more, be a bit more direct and make sure we changed where the pressure points were in the game. "As the game went on I thought we defended even stronger than we did earlier. I thought our defence was really good; it had to be."